This red milk paint tutorial features my favorite Miss Mustard Seeds Milk Paint color, Tricycle. I call it red because some people might not picture tricycle as a red color. This is my first Miss Mustard Seeds Milk Paint project and I went all out and did a complete milk paint tutorial in this post. It’s taken me a while to get around to this project. I wanted to wait until I had a full day to devote to the project. It’s a different paint product from what I normally use and I was a little nervous about my first go at it. I shouldn’t have been because not only was it easy, it was fun! I finally gave up on the full day thing and just grabbed the paint and went to work. I don’t seem to get nearly as many things accomplished in a day like I used too. Is it because I’m getting older or what? I still don’t have that dusting done like I’ve talked about for several posts now. And this heat has been crazy. The Owen Workshop is finished (yeah) but it’s not air-conditioned (next summer?). This would be the hottest July on record! You think I would have sweated off some weight this summer. No. OK, enough chit chat. I’ll get on with the important stuff. She’s a beauty if I do say so myself. It was love at first sight with Miss Mustard Seeds Milk Paint in Tricycle. That’s Marian’s name for the red. And luckily Tricycle was one of the colors in my sample kit. I must be living right. This radio cabinet usually sits in my living room. It’s a great display piece for my vintage handmade quilts. Before I started on my project I watched Marian’s (aka MMS) videos on you tube. They are short and to the point which goes to show that using the Milk Paint is easy. You just mix the milk paint with water and stir, and stir, and stir. It’s takes a few minutes to get all the powder dissolved, but after that you just paint. I painted on two coats and I did them back to back. That’s how fast the paint dried. Next comes the cool part. After it dries the paint just starts falling off. Seriously, it does. Marian says you never know how much will chip off and I found that to be true on my first piece. The paint chipped off the front of the cabinet and the top of the legs but not very much on the rest of it. This cabinet had been pieced together and has different wood and different finishes on it as you can tell from the before picture. I guess that’s what made the difference in the chipping. I took a sander to the areas that didn’t chip. I also used a sanding block on the front where the paint was loose but hadn’t chipped off. For a little added touch I used some Miss Mustard Seeds Milk Paint in Shutter Gray around the corners and the top edge. Just very lightly. I finished the piece with some dark wax to give the color a little more depth. Red milk paint tutorial…..a few more details…. I would definitely recommend measuring the powder and water at least the first few times you mix the paint. After that you can probably eyeball it and get it right. Of course I didn’t measure mine because I’m crazy like that. So I had to keep adding and stirring until I got the mix right. See, I’m trying to save you time. I like the hardware I chose from Hobby Lobby but it was very distracting in the photos so I removed it halfway through the photo shoot. I loved the way the paint just chipped off. The look is totally different from distressing a piece of furniture with sandpaper. I think the chippy paint makes the cabinet look more aged, as if the paint had been on there for years, versus the sanded distressed look. What do ya’ll think about the chipping. I really think this is the look I’ve been going for with some of my paint projects but I just didn’t get there because I was sanding the paint off. What can I say, I just love this cabinet now. What do you think about the cabinet and the Miss Mustard Seeds Milk Paint finish? Update to this post June 2018: I made a video using milk paint on a new project. I find that seeing the process in action is a big help. You can see it below. Links to popular Miss Mustard Seeds Milk Paint projects…..
1. My Tricycle Red Cabinet (you are here) …most viewed and most pinned of my projects on Pinterest. 2. Antique Bed painted Vintage Rose special mix MMS …..where you are now! 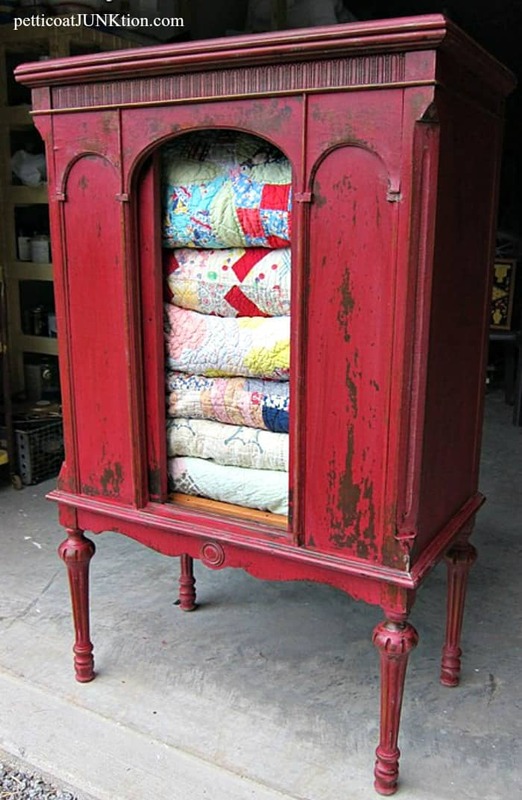 I have 3 pieces (cedar armoire cabinet repurposed for standing pantry, coffee table, end table) I want to do like this. Would like palette of khaki, amber, barn red. Can you help me? Either personal tips or where to go for tutorial. What a inspiration!You did such a beautiful amazing job and I want that! I am using tricycle for the first Time and I am struggeling to make IT cover well. Do U have any tips? I loved that you shared about painting the piece. I haven’t done any of this before so don’t know what to expect. Other sites that I have visited didn’t tell about the “paint chipping” after you let it dry. I would probably have thought, “Oh, No! I’m going to have to start over!” Thanks for filling us in. Love the tricycle red paint. My favorite color is RED, so it is extra special. I love this piece. I have a couple pieces very like this one and I would love to do the same thing with them. Thank you for the tutorial. Seeing what you did to this just made up my mind on the color I am goin to use! I love the cracked & chipped look! That paint sounds awesome.. will definitely have to try that finish on a project soon. Love the way the red turned out…. The rustic, peeling paint look would really make a room POP! Nancy, can you tell me how well the paint-job holds up (since you did not use the MMS primer method), as you painted this piece some time ago? I mean, does it just continue to peel, chip, as would any other paint applied to an unprepared surface? I want to use it on a piece that will get a LOT of use. If one applies regular (acrylic-based) paint on unprepared furniture, it produces the same effect, and continues to degrade. I’ve been asking this question since MMS paint came out, but I haven’t gotten any feedback. Thanks! I was excited to find your blog as I am originally from West Tn (my whole family still lives in Camden :-). I now live in SoCal and have a few antique pieces I am about to tackle. My first project will be my husband’s great grandmother’s dining set, buffet first. I’ve painted a few pieces of furniture, but not with milk paint and not an antique. I am a bit nervous I’ll mess it up, but I love the look of peeling paint! Thank you for making it seem so simple! Wow, what a difference from the original. I absolutely love how it turned out. I’m partial to red anyway, but it looks amazing! Maybe after Christmas, I’ll get brave enough to try something of my own. Thanks for the inspiration. This is gorgeous! I have a piece I want to do in red. It’s freaking my husband out a bit – I think this is the perfect picture to show him! Just like all of your pieces, this one is amazing too! Thanks for linking up with “Throwback Thursdays” Kathy! Kathy! I love the way the quilts are displayed. I’ve never used Ms. Mustard Seed paint but I have used Annie Sloan. You project is beautiful!! Thanks for sharing at Throwback Thursday!! Love how this project came out! I have been itching to try out Miss Mustard Seeds Milk Paint, the color is wondeful! Looks great! I just did 2 tables and had a hard time because I think I cannot get the consistency correct ~ it was like milk and should have been thicker? I was sorta disappointed with the result and I also had to use several coats to get it to cover…I think I’m just paint-challenged?! Also, what is the correct kind of brush – my retailer said to use a chip brush but that turned out bad so I used a regular angle brush and a foam brush. I really need help with the consistency issue! thanks! 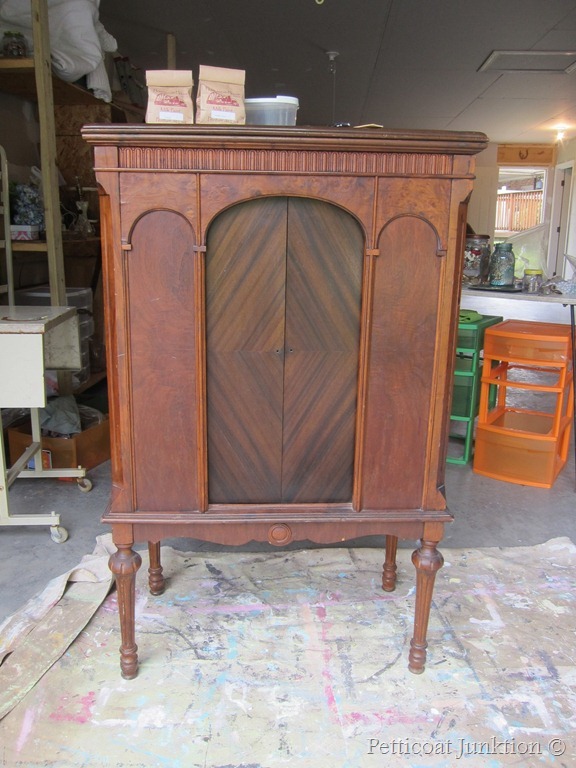 hi Kathy, I’ve loved this piece for ages, such a beautiful makeover and little piece and then this week I found a very similar gramophone cabinet and wanted to paint it similarly but then sold it before I got to paint it. ANYWAY was just wondering if i can use one of your photos (just linked from your blog) to tell the story? What type and brand of wax did you use on the top and have you ever tried just using hemp oil for the top? What do you recommend? I used Howards wax in oak. I have used Hemp Oil on older painted furniture, but not on a newly painted piece. It really brings the paint back to life on older pieces. I plan to paint Miss Mustard Seed’s Milk Paint piece soon and use the Hemp Oil. 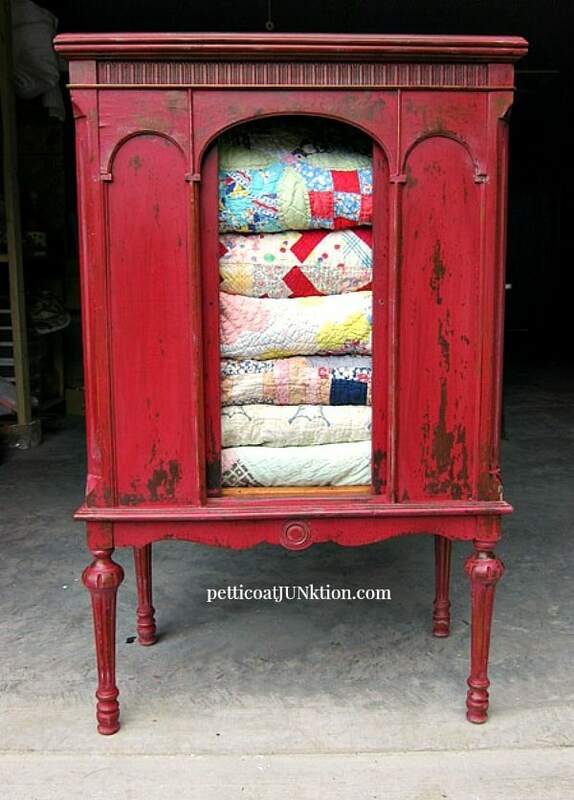 Perfect display for your quilts…I LOVE the Red!!! LOVE the color! Must use ASAP! Hi Martha, I got it at Hobby Lobby. Love their knobs and they are always half price. Finials are a great idea…..have to try that! That’s a great look. I’ve never used milk paint but I’m intrigued. I have two square columns in our three yr old house. The wood is poplar so we primed it in prep to paint it the white trim color. But as it dried we liked the streaks in the primer coats so we left it waiting for a creative lightning strike. Would the milk paint with wax be smooth? Once waxed does it stop chipping off? I’d love a neutral white that would be there without screaming at me. Any suggestions? I think this is the best makeover I have seen yet! Your finish “truly” makes your piece look like a well worn antique. Bravo!!! It’s so beautiful! Thanks got the before and after pics. It’s helping ME be brave..I hope. I have an old dark mahogany chest. Great bones, but just dull dark almost black and boring. Now I have to decide which color milk paint!!! Any suggestions. All of the colors are nice it just depends on your decor. It sounds like you want something lighter. The Mustard Seed Yellow is nice and so is the Lucketts Green. Love the quilts in the cabinet! 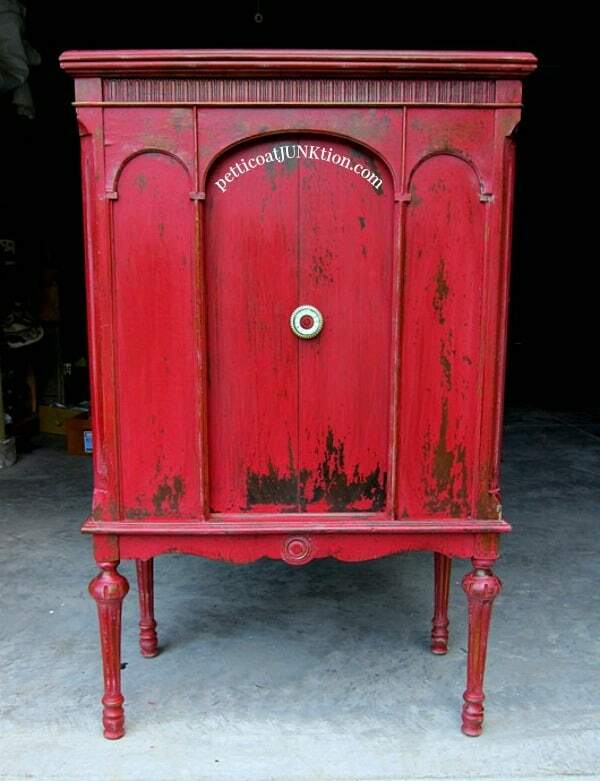 Loved the original cabinet…and the new paint job as well! Thanks Lisa, I love my quilt collection. Some were made by my grandmother and others I picked up along the way. I just used MMSMP today in tricycle and Googled “wax Miss Mustard Seed Paint” to see if I should use dark or light. Your radio cabinet showed up so I had to leave a note about it – turned out fantastic so I’m pinning it too! Thanks Judy,I am a fan of the color too. You did a fantastic job. I love the color. I will be featuring this tonight at my Fall into Fall party that opens at 8pm EST. Please stop by and pick up an I’ve Been Featured button. Thanks.